In spring 2016 Northcliffe will begin to advertise for a Host-Evangelist. Northcliffe Church is enlarging its tent and strengthening its stakes, by opening its premises and people to the community and sharing the Good News of Jesus with those who use its spaces and the neighbouring community. The fellowship seeks to appoint and commission a committed Christian who wants to share the love of Jesus with others to be a Host-Evangelist/s to be a tent keeper and enthusiastic host with a heart to share the Gospel and bring those who use the premises and our near neighbours into fellowship in Christ. We look forward to working with them to deepen our own commitment and enthusiasm to be confident evangelists, as we, individually are called and equipped by the Spirit. Northcliffe is looking for an evangelist/s who can help with the running of our premises and meet with our users and neighbours, ready to share good news and by God’s grace enlarge the family of God at Northcliffe. 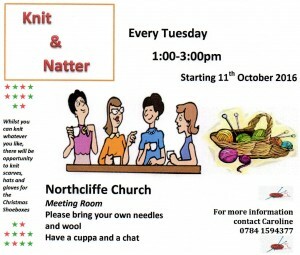 Northcliffe Church is an Ecumenical Partnership of Methodist and United Reformed Christians and would welcome interest from Christians of other denominations and congregations. Fairtrade Rep sought to run a stall after church maybe once a month. Items can be obtained on a sale or return basis from a co-ordinator at either St Peter’s or Shipley Baptist Church. Speak to Gwen to discuss this idea.